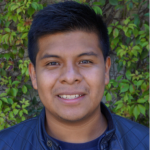 Gerson is originally from Solola and currently lives in the capital city. He was selected as a GOJoven Fellow when he was 19 years old and has a Bachelor’s degree in Letters and Sciences. Gerson has professional experience serving as President of the Department Committee of the Association of Young Ex-scholars of the state, as well as teacher and coordinator of an English project in Solola. He gained experience working with Sexual and Reproductive Rights during the implementation and execution of the Action Plan that he developed as part of his GOJoven Guatemala cohort. He hopes to one day create an organization that empowers the adolescents and young people of his community with topics of sexual and reproductive health and rights.